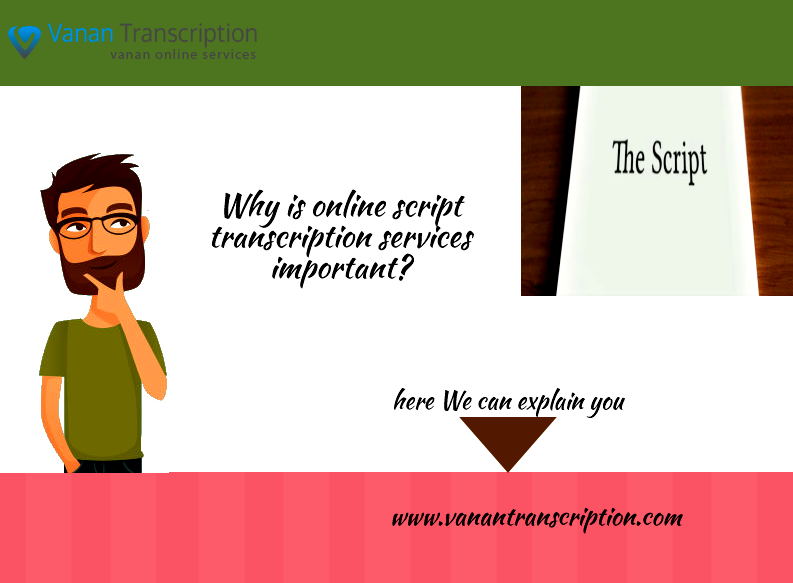 Why is Online Script Transcription Service Important? Script transcription refers to the creation of a written text of all kinds of movies or films, TV programs, documentary, news broadcast and more. As a service, it supports scriptwriter, movie producers, documentary makers, and production houses. In the US, congress requires TV stations to caption their programs. With the recent development, these backend services are outsourced to script transcription companies. This will benefit those with hearing impairment, and everyone will gain from a good viewing experience of the video to the fullest. Through captioning, viewers who don’t know the language in the video can catch up with the dialogue. In establishments, like hospitals, libraries, airports, where the volume of the sound is turned down or off, viewers can still appreciate the video. Everything starts from a reliable transcript that can be used by a client according to his wishes. It can be translated or used as-is for a script and part of the post production in a film. Or, as captions where spoken words are embedded in the film. Nowadays, marketers use content in their marketing strategies and a transcription with keywords can improve their SEO ranking. With the internet, online script transcription services can be easily accessed. With a click, a client can have access to information such as quality, price, and turnaround time. Professional companies offer a one-stop solution for all your film needs. Native speaking transcribers are on hand to assist a client with an online script transcription service in whatever language. Scriptwriters, editors, and translators can make changes in the script to fit your project. Closed captioning service will entrench spoken words into the film for a pleasant viewing experience. Native speaking voice talents will handle your voice over the requirement that will connect with your target audience. Before a client locks up the service of a transcription company, there are different factors that he should be aware that determine script transcription rates. Audio quality is categorized as substandard and good. Hard to decipher accents, background noises, and poor quality that hinder the recognition of words is classified as a substandard audio. Transcription is pricey compared to a good quality audio. Transcribers have to coordinate with the client to chip in words to complete the content. Audio with good quality makes transcribing easy and can be accomplished in lesser time. Know the duration of your film; script transcription is cheaper for shorter audio. Transcription prices vary, some companies charge by the hour, by the minute, per page and per word. will go through the normal process and you will receive the material in a couple of days. The audio or video file is cross checked for the number of speakers. Prices differ for a one on one speaker, like in an interview, and multiple speakers, like in a conference or seminar. A speaker’s identification can be included for easier reference in preparing a script. Time is coded in the transcript, indicating when a speaker starts and ends his dialogue. There are two choices for a script transcription format, verbatim and edited. The verbatim format includes all unnecessary sounds, fillers, mumbles, emotions and spoken words. It is tedious work and takes more time to prepare. These are the most expensive ones and are mostly done for legal proceedings. For the edited version, some sentences are omitted by the transcriber as well as clutter, but the sense of the audio is maintained. Next Post:Why Fast Accurate Transcription So Important?